I recently covered the topic of Amazon listing hijackers, or those who will sell counterfeit versions of your private label product. It was interesting to hear how many people this has actually occurred to. Today I want to cover a similar and related challenge: what happens when someone launches a nearly-identical private label product to yours? This has happened to us recently with our Jungle Stix, as we have new competitors who are following our launch process very closely. 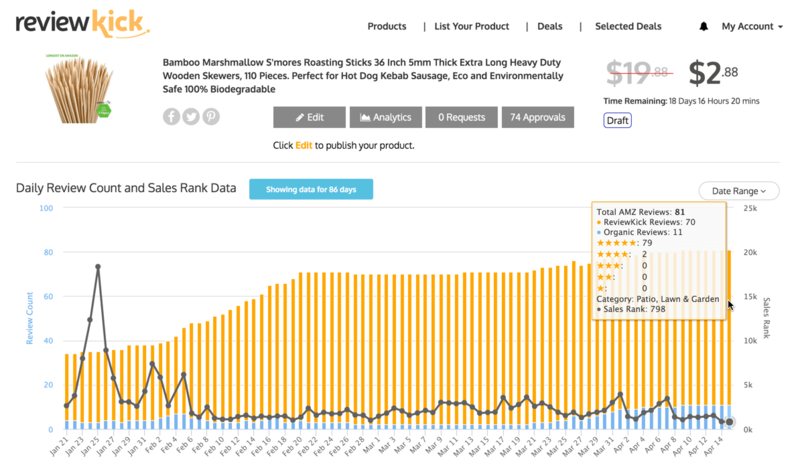 So closely, it seems that they modeled much of the product, listing, photos, and keyword targeting on Jungle Stix. They don’t call it “Amazon” for nothing, there are twists and turns at every corner! 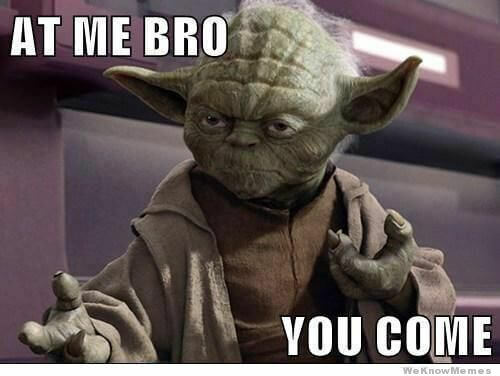 We can channel our inner Yoda, and attack this with intelligence, and not frustration. Let me be clear that I fully expected a person or two to launch a similar product after we publicly launched ours. It’s all in the game. Selling well on Amazon is often based on observing the success of other sellers or products, and capturing some of that demand with a similar, but improved, alternative product. We used that strategy in finding and launching Jungle Stix. Others have done that with us. At least more people will have better campfires and s’mores this summer! So who is our friendly competitor? A crafty brand by the name of Whole Stix (is this implying that Jungle Stix are half sticks 🙂 ? The Whole Stix listing does look pretty solid. Can we all take some credit for that? Yes you should, so pat yourself on the back. If you haven’t seen the webinar and blog post where we put together our optimized listing with Scott Voelker, it is tremendously helpful in finding and including the right keywords. It looks like their Product Title, Product Description, and photos are well optimized. The photos look very similar to our Jungle Stix, and they are one-upping our value by offering 150 pieces as opposed to our 110 pieces. They are the identical product, but they are offering more quantity at the same price. What do we do? Well, let’s take a closer look… are they really offering an identical product? Just because it is more, doesn’t mean that it is better. I look at the product photos, and it seems to be a thinner stick than Jungle Stix. Our sticks are 5 mm thick. Whole Stix doesn’t mention the width of their sticks, but it seems to be thinner than ours. We have already included “5mm” and “heavy duty” in our product title, but in order to further differentiate our product and convey the premium value over this new competitor, I may want to make changes to the listing. For example, positioning our Jungle Stix as more premium, thicker sticks that won’t break or bend like the “alternatives”. Side note that I recently received a note from a Jungle Stix customer who uses the sticks as stakes to support her orchids…brilliant idea, maybe we add that to the listing to target those search queries as well? So we are still ranking above them for the main keyword we are targeting, which is good news. Whole Stix looks like it has placed “skewers” just slightly ahead of where Jungle Stix placed “skewers” in the Product Title. Could that be why they are ranking ahead for the keyword? And how many more people search for “skewers” vs. “sticks”? So Google assesses “bamboo marshmallow skewers” to be searched less than 10 times per month, which is also probably negligible traffic on Amazon. That is good to know though. I can see that there was a big improvement in the Best Seller Rank on 3/28/16, represented by the green line suddenly dropping from a Rank of 20,000 to 10,000. As I continue to track this in the Product Tracker, I will want to keep an eye on the Best Seller Rank and their daily sales. If their BSR continues to improve, and they start ranking higher for the same keywords that we are ranking well for (ie “marshmallow sticks”), then they should see increased sales. At the same time, we may see it affect our daily sales, assuming we are competing for the same customer. One interesting thing that I noticed from the Product Tracker info on Whole Stix is that there are two sellers for this product. Theoretically, it is a private label product, so there should only be one seller of the product. A potential hijacker has been spotted! Since you may be reading this, Whole Stix seller, you should read this piece on protecting your Amazon product listing from hijackers. Before I address the strategies of how to take on competition, let’s get some context to see how the competitive listing of Whole Stix has impacted Jungle Stix sales. In short, the impact has been negligible up to this point. What does this mean? Basically, if we focus on our own priorities and take care of our business, we will continue to grow in sales. We are converting more visitors into customers, so let’s get more visitors onto our page! Spoiler alert: the strategies that we use to take on competition do not actually address competition directly. It is more focused on what we can do as the sellers of Jungle Stix, because that will yield greater benefits than worrying about other listings. Let’s see why that is the case. We are in the enviable position of ranking ahead of Whole Stix for the main keywords like “marshmallow sticks”, and because we have built up a significant history of sales and positive reviews, we can continue to cement our strong keyword ranking for the important keyword searches. I already mentioned that a customer gave us a heads up that Jungle Stix are a great solution for support orchids, and probably other fragile plants and flowers. Could we tailor our listing to appeal to gardening type customers, who need stakes that are sturdy yet flexible, made of bamboo, and relatively cheap? We can dig in to that with some keyword research to figure out if there are enough people searching for that. You can read more about Amazon keyword research in a previous blog post here. Why does improving our product listing matter? Because if we can get a better idea of who our customer is, and what they are looking for, we can likely convert more visitors into customers. We have seen that our sales and conversion rate have continued to improve recently. And when we first decided to sell bamboo marshmallow sticks, we knew that it was a slightly seasonal product, with summer and early fall as the peak season. You can see that July is going to have the most traffic (working under the assumption that Amazon search queries will behave similar to Google). March had 290k searches, and July had 504k searches, so there are actually going to be about 70% more related searches come July. That is a big bump in demand! 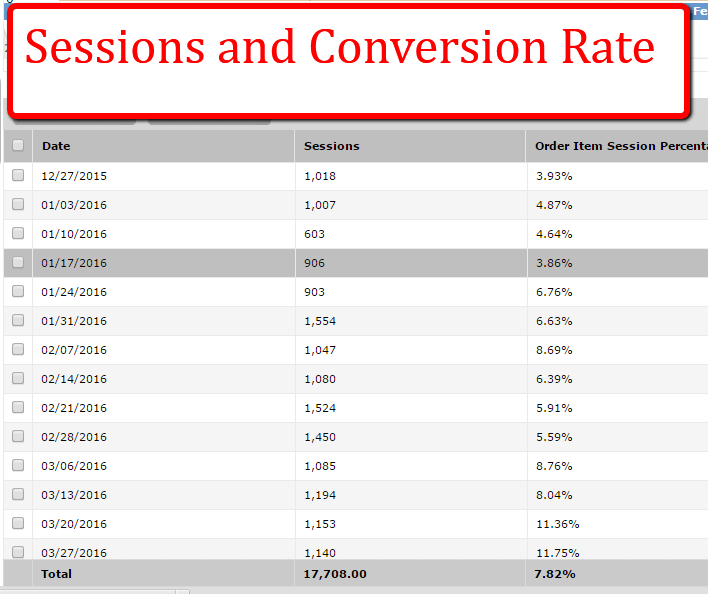 At 2000 visitors per week, the difference between an 8% conversion rate (which is what we had in March) and a 10% conversion rate is the difference between 160 and 200 sales per week. 40 sales per week, or 160 sales per month, is $4000 if each unit sold is $25 in revenue. Even just doing this quick back-of-the-envelope math, it’s easy to see that optimizing my own listing will yield much greater benefits than if I worried about a new competitor who hasn’t impacted our sales much at this point. I am aware of them, but not reacting to them. One thing that I don’t want to do is compete on price and under-price myself. The landed cost of the Jungle Stix is a little less than five dollars (which includes cost of goods sold, and all importing and domestic shipping to Amazon’s warehouse). The Amazon fees are about $9, and add in a dollar of miscellaneous marketing, pay per click, and refunds/returns, and the profit margin when we sell at $20 is about the same as a venti cappuccino from Starbucks. Have you heard the phrase, “No one wins in a knife fight.” Well, the same can be said of a price war in business. No one wins. I will not drop my price any lower than it currently is, but I felt compelled to maintain my ranking and sales in the off season of January and February in preparation for the prime summer months. My pricing was definitely impacted by the reduced demand and increased supply from competitors, but I won’t engage in a race to the bottom with price. And I highly recommend that you also don’t feel compelled to compete on price if you have a competitor with a nearly identical product at a cheaper price point. Instead focus on emphasizing the aspects of your product that make it better than the alternative. In our case, I think that it is a better quality product (as measured by the 5mm width of the stick) and the dozens of happy customers, evidenced by our reviews. Important Update: October 2016 – Due to changes in Amazon’s Terms of Service addressing incentivized reviews, utilizing promotions to get honest reviews is no longer allowed. Review Kick has now been relaunched as Jump Send, focusing on email communications to help Amazon sellers grow their business. Jump Send does allow promotions, which is useful to increase sales velocity, but it does not allow any incentivized reviews. Find out more information in our relaunch blog post. The below information was correct at the time of publishing. Getting more honest Amazon reviews, and running some intermittent promotions, is a great way to increase the lead that we have over Whole Stix. Running promotions to get reviews is essential for a product launch, and we used Review Kick get a good amount of reviews quickly. But promotions and giveaways are a strategy that is important to continue throughout the life of your product on Amazon. I plan to run a few more giveaways in the next few months so that when we have the surge of traffic in July, we have a significant amount of reviews to validate the quality of our product. I also need to assume that Whole Stix will have a similar strategy, so if I did not prepare a promotion, then I would be allowing them to catch up! One additional thing that I’ve done to get more reviews is follow up with customers to ask for product reviews. I will cover this technique in detail at another time, as well as an exciting announcement in that regard 😉 . Since I have started reaching out to customers to get product reviews, I have received 10x more organic reviews. In the screenshot below from Review Kick’s analytics dashboard, the organic reviews started increasing from late March, when I started emailing customers to ask for reviews. This is huge for us, and something I will continue to do. We already know that the conversion rate for my products has been increasing, and may continue to increase as high season approaches. While I am working on optimizing my listing by finding new keywords, I can also work on getting more traffic from Sponsored Ads. I have set up campaigns that max out my bids and put me in the top position for the main keywords. 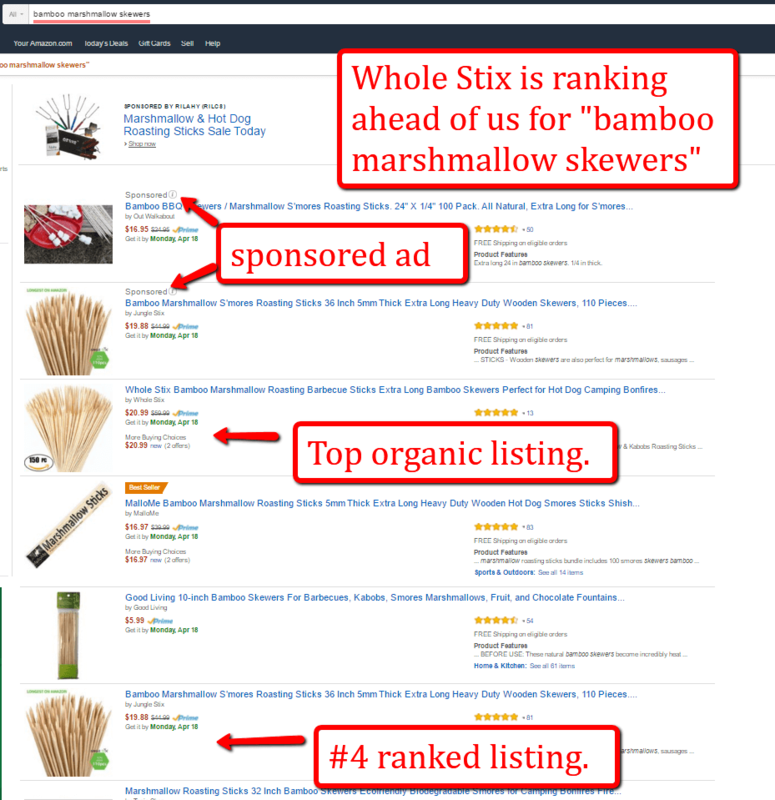 You can see for example that on a search for “marshmallow sticks”, Jungle Stix has the top organic position and the top (right column) position for the sponsored post. This is great for Jungle Stix, because it maximized the real estate on screen. Of the 6 listings on the page above-the-fold (i.e. without scrolling down), we have two of those positions. This increases the likelihood of a click on our listing. And if a visitor to our page will convert at 12% to 15%, that’s not a bad investment! We will dig in to Amazon Pay Per Click campaigns on an additional post, and have covered it to some extent in this Pay Per Click blog post. This strategy requires some investment, in that you may pay more per acquired customer while you increase your bids on relevant keywords. Why spend more on this? Because ultimately a sale is a sale, whether the customer arrived on your listing via sponsored ad or organic search results. It is worthwhile for you to pay to have a customer click on your ad and land on your page rather than purchase from your competition. So 1 in 10 people will land on our site and purchase the product. That means our maximum bid should theoretically be $0.50, as it would cost $5.00 to get 10 clicks, one of which should convert to a sale. Does that math make sense to you? Our maximum bid is more than $0.50 though, yet are actual Cost Per Click is less than $0.50 because that is how the Amazon auction is currently shaking out. We’ll see though, how our friend Whole Stix responds after seeing this post…. If you can scrap together a few sales from search queries or niches that you didn’t anticipate, that can help you get more sales, more reviews, and rank for new keywords. So dig through your campaign reports to find any new ideas, and add them to your pay per click campaigns. One thing that we could do to help differentiate our product from Whole Stix and other competitors is create a bundle. A bundle is just a combination of related products packaged together and sold as one product. Bundling is a great strategy as it provides value to your customers by pairing complementary products together, often at a discount than if purchased separately. And for you as a seller, you are making more profit for every sale, while also creating a differentiated product. The bundled products must be related and complementary. Each bundle must have its own unique UPC code. Selling a quantity of the same product is not a bundle, but is a multi-pack. You can read more about the guidelines on Amazon’s Bundling Policy here. We created Jungle Stix as a case study, and not a profit-driven business. So I won’t go through the process of finding a creating another complementary product, but that would be a good opportunity for Jungle Stix’ next steps. There are two things that I plan to do while ramping up to the peak months. Get your notebook out, Whole Stix! Just kidding…. What do Amazon reviews and good karma have in common? You can never have enough! So I will run some promotional campaigns on Review Kick to get more reviews. As you could see from the Review Kick analytics screenshot above, we are continuing to grow our base of reviews, via promotions and organic sales. I will continue this practice of email follow ups, as it was an untapped opportunity that I have just started taking advantage of. Ask any savvy marketer or business person, they will tell you that A/B testing is imperative to success. A/B testing, often also just called split testing, is comparing variations of a web page to see which variation converts best. It is important that you run a split test with controlled and randomized visitors, so the data isn’t skewed in any way. So that is an overview of how Jungle Stix are selling now, and how we have been impacted by our new competition. As you can see, it is important to be aware of the competitive landscape and its effects on your product. Sure, we may have lost some sales to these Whole Stix, and we have had to react to their pricing tactics as well. However, if we take care of our own business, meaning get more reviews and convert more visitors into customers, we can thrive regardless of what the competition is. 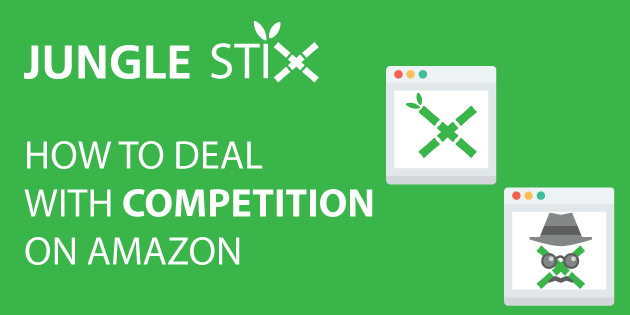 I think that is the most important takeaway from this competitive analysis of Whole Stix: the power to succeed as an Amazon seller is within our control, as long as you maintain a flexible and strategic approach. I hope that this has been helpful for you, please share your questions, comments, and thoughts in the Comments section below! I love hearing from you, so don’t be shy! Hi Greg, Thanks for the detailed breakdown of how you deal with competition. I just wanted to ask how you deal with getting back up in the rankings after you’ve run out of stock. I’m in this situation at the moment. Do you go more aggressive on PPC campaign or do a round of giveaways? Rachel, that’s a great question. How are you planning on dealing with the situation? We will definitely share the strategy and results when Jungle Stix are back in stock! Everything you guys post is always the BEST! I see you mentioned writing up about how you are going to handle a relaunch after running out of inventory, have you posted this and if so, could you point me to it as I am going through the same situation. We are actually still out of stock in regards to Jungle Stix, they are currently crossing the Pacific…stay tuned on the blog though to see, probably in the next 3 weeks. You will probably want to consider running some promotional giveaway, and PPC campaign to kickstart some momentum after you relaunch, and maybe more aggressively than you would before (ie higher bids, expanded keywords, and/or maybe broader match type). Thank you for your all the information you have provided to us. I now have 2 PL products selling about 11 units on each per day. Here is the quick observation that I just made this morning, I can not find the listing for Jungle Stix on Amazon and Whole Stix is now a “Best seller.” Glad to know it is more of an inventory issue than “taken down” situation. What companies do you recommend for customs, inspections, prep/fulfillment center? Appreciate the value your team provides! We’ll be covering that with Shapiro (they do customs) in a webinar on 5/4. I have just started following. I had your listing open then today I went back to search, and now i can not find your listing, did you run out of inventory and get removed from results? in any case, I am really enjoying the case study and plan to buy your software and start in couple weeks (I have to finish some college projects first, I also decided I want my 4 year degree). Yes, Jasper, you are correct….will be back in stock ASAP! However I found that some customers get a coupon code but not leave a review. What should I handle this issue ? Thanks for all the great information on this blog. I will soon add my second product to amazon.com, using Jungle Scout for the search. My first product is in the sports category, which seems more competitive than others. (Lots of young sporty people doing white labeling, perhaps?) However, the best opportunities I found now are in other categories. I have two questions about this. 1. Would you insist that building my sports brand is more important and that I should go for a sports product (as it’s only my second product), even though I see somewhat better opportunities in other categories? 2. If I start a second brand in, say, home and kitchen, would you recommend getting a second account on Amazon? How difficult is that in my situation (with one account with only one product)? How did you create an account just for your Jungle Stix brand? I appreciate any feedback so thanks a lot in advance. I know, this is too funny! Thanks for the extremely helpful article! I just purchased the Jungle Scout Pro Chrome extension and I’m starting my product research. Looks like someone forgot to update the product name when they plagiarized your product description! Appreciate your thoroughness in explaining this. I also appreciate your willingness to share in order to help the rest of us PL-ers. Your posts are pertinent and very much-needed. I have been following you for a while, and you’re really great! I’m a successful Amazon private label seller, and I’m constantly trying to Leary and improve. The Amz Split is something I never heard before, and it sounds awesome. I just wondered, don’t you think it may efect your keyword ranking if you keep on to make constant changes to your listing? Some say that every time you make changes in your pictures and in the title, it effects your ranking for keywords. Changes to your listing can certainly effect your keyword ranking, however, hopefully in a positive way 🙂 That’s one of the things you can test for! I’m hoping some changes move us further up in the rankings. Wow! What a great read! As usual you’ve come through with a plethora (good word huh?) of valuable techniques and information!